The Ill Fated Dieppe Raid . | The Military history of Slindon. 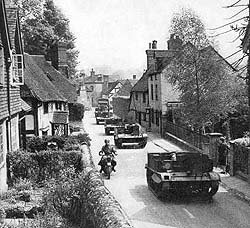 Canadian troops on the move thought-out the villages and towns in West Sussex. The First Canadian Division, Headquarters Kneep Castle West Sussex. The First Canadian Infantry Brigade. Slindon House West Sussex. Canadian prisoners of war – 1,874 were captured in the raid. In 1942, members of the Canadian army were encamped in the hills and towns of the South Downs around Brighton., Worthing, Littlehampton, Arundel, Slindon, to name a few of the locations. They were about to embark on a daring raid on the Nazi held French port of Dieppe. On Sunday 19th August 2012 at 12 noon we will be commemorating the 70th Anniversary of the Dieppe Raid with a service at the Dieppe Raid memorial, situated within the Allied Special Forces Grove, which is part of the National Memorial Arboretum. Further details are available from the NMA website http://www.thenma.org.uk or from http://www.memorialgrove.org.uk. I will be glad to assist with any enquiries about this event on 07929-118598.